Copyright © 2009- 2019 by Scouts on Stamps Society International, Inc. All rights reserved. and corrections for the already published covers in the print Catalog Edition. 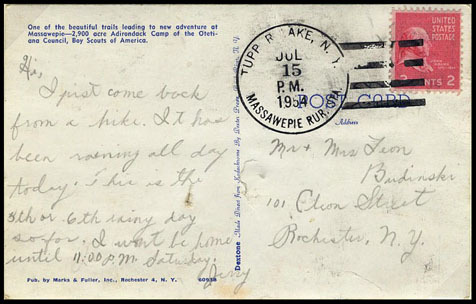 Example on message side of Bear Mountain Landing—End of Boy Scouts' river hike postcard. The Albertype Co., Brooklyn, NY. Published by Boy Scout Camps, Kanohwahke Lakes, Tuxedo, NY. The machine cancel was used during the summer camp seasons of 1928 & 1929. Long Pond. The park is now Harriman State Park. here reflect the quality & condition of the actual pieces shown. 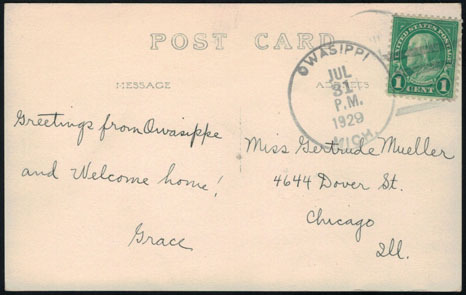 Example on message side of Camp Leeming mess hall postcard. The hand cancel was used during the summer camp seasons, 1925 — 1929.
comparison, the image in the Print Catalog is an enhanced composite of two different cancels. 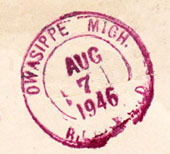 June 29, 1929 states "Post Office Name Changed Owasippi, Mich., to Owasippe. Effective August 1, 1929." or earlier, and is the earlest cover the Editor is currently aware of. 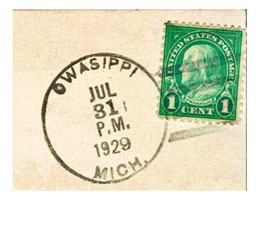 If we can record a 1924 Owassipi, it would become the earliest [known] US Scout cancellation. Balboa Canal Zone Earliest Usage of #34-2 "Old Ironsides In Canal Zone"
This H.W. Hodge / Balboa / C-80 cover is a "new" find first appearing on the market in 2017. Transit of Pedro Miguel Locks in the A.M. Most Common Cancel Used on #34-2.
only the March 7 date as well as only the April 7 date. Neither ship cancels used in conjunction with #34-2, nor colored cancels are common. we don't know is where the Constitution was in its journey through the Canal when the cancel was used. on the 1904, 1908 & 1912 Canal Zone maps. And "San Pablo / C.Z." would fit perfectly in the bar. argument is to hold water,....then the A.M. times on both the front & back cancels can't be accurate. I'm afraid that more information is needed about this otherwise unrecorded cover. 04/07/34 Penalty Cover Along the last half of the trip through the Canal. A penalty cover, Navy Dept., Official Business. Autographed "Commander Louis J. Gulliver U.S.N. Captain of the U.S. Frigate Constitution 1931-1934". Cristobal Canal Zone End of Cruise through the Canal in the P.M.
On 04/07/34 The Constitution departed Balboa at 7:27am and arrived in Cristobal at 6:57pm. 08/19/42 Ten Mile River, NY Used through 1953. Example on Boy Scouts of America Postcard ©1947 National Supply Service Cat No 3056. Many Point Boy Scout Camp opened in 1946. The Camp had its own PO from 1947 through 1951. The Post Office was on Camp property in the Trading Post. The building is now the Commissary. 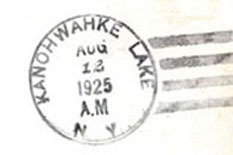 In 1952 the Camp PO closed and mail went through the Ponsford, MN PO, which it does to this day. Many Point is located within Toad Lake Township of Becker County. 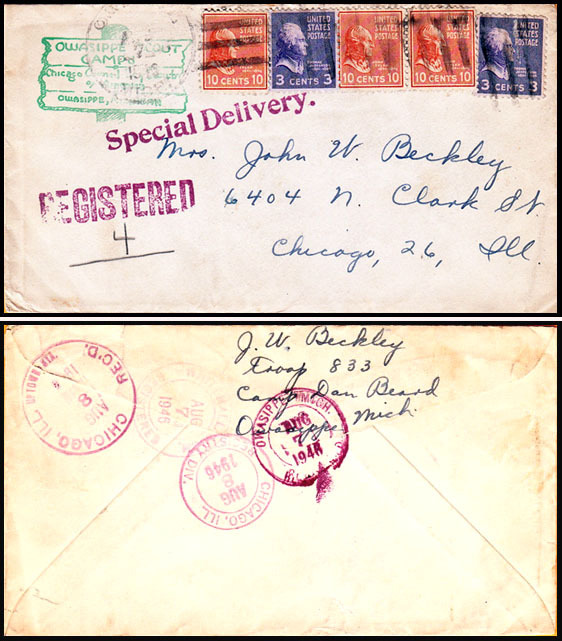 Sent In the 5th week of the Camp's 1946 season, this was only the 4th piece of registered mail. catalog. See #38-1b on page 274 of Additions & Corrections in the 1930s decade. the First Day of Issue cancel. Those with Cancel #6 are scarce. 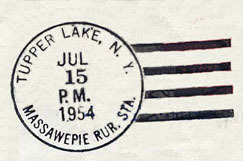 Tupper Lake, NY Massawepie Rur. Sta. 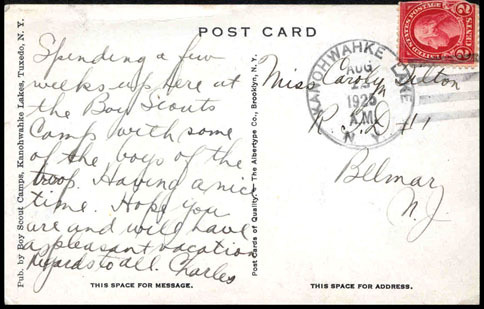 Example on message side of Massawepie Scout Camps trails postcard. Dextone Dexter Press, Pearl River, NY. Published by Marks & Fuller, Rochester, NY. were in use 1961 through 1969 and are cataloged in Volume III. Station PO itself was within the Camp boundaries & on Camp property. 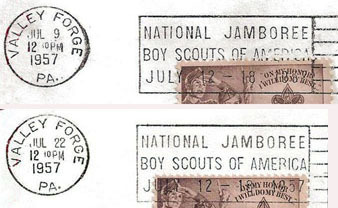 See a 1952 Cover from the Camp in the Corner Card Section of US Covers. opening & for 4 days after the official closing. These dates are scarce.